Seeing as many exciting engineering things in Britain as possible in one 3-week driving holiday – this issue, Days 1 – 4. Tonight we are at Southampton on Christmas Eve. 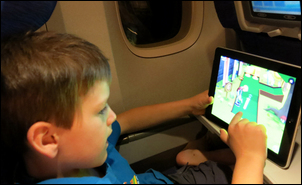 The flight from Sydney to Heathrow was long and rather tiring but reasonably comfortable. We all found sleep rather difficult. Alexander (my 8 year old son) was good and our pre-booked seating positions worked well. On arrival, we picked up the hire the car and drove from Heathrow to Southampton on a motorway… easy. The people here drive so fast they'd get locked-up in Australia - people passing me at 140 km/h, one after the other. 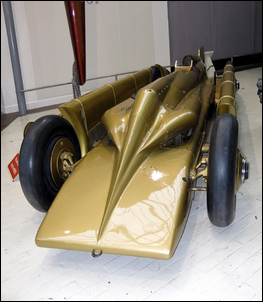 …and also the Golden Arrow land speed record car of the late 1920s. 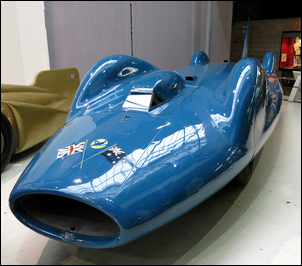 The Bluebird was just as I had expected – I’ve read so much about this car. But the Golden Arrow was startlingly different – a mixture of long, flowing lines and sharp edges. A good museum but a bit smaller than I expected. We had a short sleep this afternoon at the hotel and will have an early night. Georgina (my wife) can't understand the accents and I can't understand the coins! 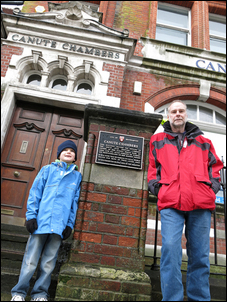 We spent yesterday looking around Southampton (we went for a walk) and then drove on to Portsmouth. 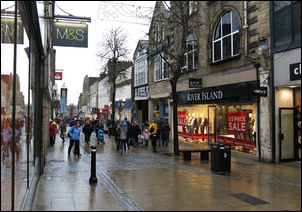 Being Christmas day, everything was shut and deserted. Southampton was pretty boring but for two exceptions - we saw the offices from which the sad news of the Titanic was given out to relatives; and the seagulls here are enormous - about 1 metre wingspan. 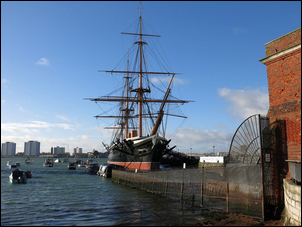 Portsmouth was interesting, with a lovey rejuvenated harbour area boasting a mix of old and new. Today (it's currently about 5 am - our sleep patterns are still not back to normal) we will go to the Boxing Day sales in both towns - we had to insert an extra day here as we cannot enter the hovercraft museum until tomorrow. 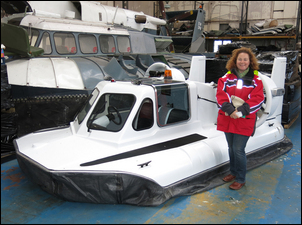 However, we took the opportunity yesterday to look through the hovercraft museum’s wire gates - the craft look very impressive, the biggest being absolutely huge. Driving around is easy - our hire car (a diesel Hyundai i40 wagon - dunno what happened to the booked Passat!) has turned out to have a good nav system that we're now using all the time. The roads are well signposted and, so far, traffic has been minimal. 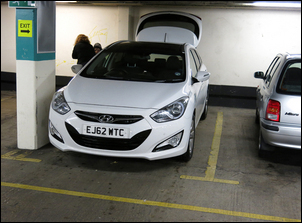 However, over here the i40 is a big car – the underground carparks are so tight that I am sometimes hard-pressed to fit in in the provided spaces. 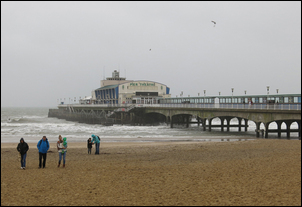 We also drove down to Bournemouth, a very nice seaside town complete with classic British pier and amusement park – the latter operating despite the gale-force winds and cold rain! Today we drove from Bristol to Falkirk, midway between Glasgow and Edinburgh. 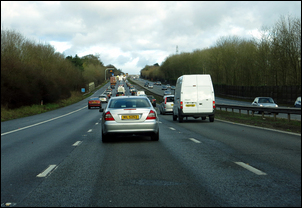 It was a straightforward drive, mostly on a 3-lane motorway. It rained lightly all the way, and there was plenty of traffic, but the road was excellent. On-route we stopped at Lancaster, a small town, and walked around. Plenty of charity op shops (exactly like Australia in terms of prices and stock); and also a castle and lots of old buildings. To my eyes, the town was rather dark and dreary. When Georgina went to the auto teller, I could see her face illuminated by the machine's lights... and that observation was made in the middle of the day and from 20 metres away. In winter, even in the middle of the day, it doesn’t get very bright. Yesterday in the late afternoon at Bristol we tried to see the SS Great Britain (too late in the afternoon; it had closed) and this morning while it was still dark we looked at Brunel's Clifton suspension bridge (finished in 1864). It was drizzling slightly, and the bridge was quite magnificent. We walked across it, then paid the 50p toll and drove across it. A really wonderful, evocative structure still in general use. 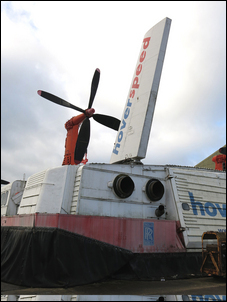 Prior to Bristol we went to the hovercraft museum at Lee-on-the-Solent. It was a great set-up – Warwick Jacobs, the man in charge, opened the museum for us, told us we could spend as long as we liked, then left us to our own devices. He was available if we had questions; otherwise we were on our own. There were about 70 different craft, but for me the two big SR.N4 hovercraft just dominated. These were awe-inspiring. 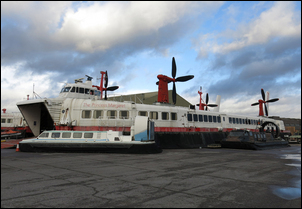 I found the huge, beached and immobile craft impressively forlorn; engineering artefacts of a (recent) bygone era, presented just as they left service. We were able to do whatever we wanted, so access to the cockpit was just a ladder away. 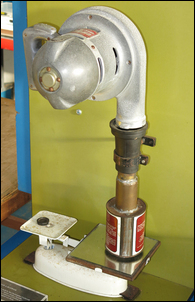 They also had Christopher Cockerell’s original hovercraft model, and even the blower and kitchen scales he used to experiment with the initial hovercraft concept. Quite amazing - and for me, my trip highlight so far. We are tonight at Falkirk, about midway between Glasgow and Edinburgh. 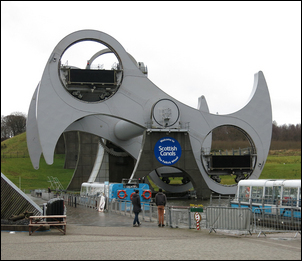 The Falkirk Wheel, the modern engineering construction that lifts canal boats the 35-odd metres from one canal to the other, is a marvellously whimsical piece of engineering. We watched it in action for ages: each gondola of the rotating wheel carries around 250 tonnes of water and/or boats. We saw some quite fantastic things today - but Alexander and Georgina have a vomiting bug. They could still do most things but felt pretty miserable with it. 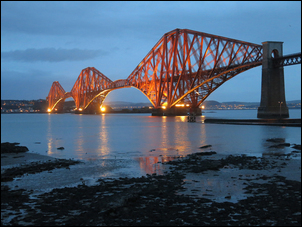 This morning, at first light (about 8 am...) we got to the Firth of Forth bridges. The rail bridge is the most fantastic bridge I have ever seen. 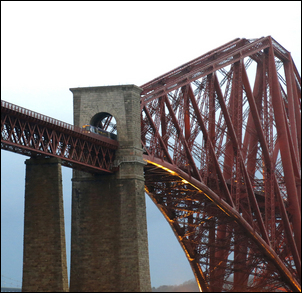 It looks immensely strong (no original Tay bridge, that's for sure) and it has a presence that is just stunning. 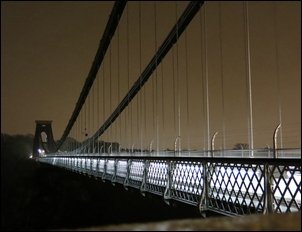 The suspension road bridge nearby looks just pedestrian - despite it also being, in isolation, a pretty fantastic bridge! 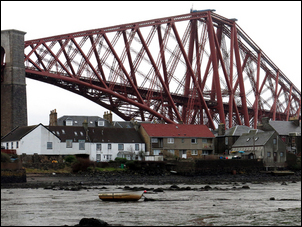 We stayed at the Forth bridges for a few hours - I could have watched the rail bridge for days. The booming, hollow sound as the trains crossed it (one about every 15 minutes), the changing colours, the passing under of it of a ship that looked like a toy.... it's a colossal structure that just dominates the natural and built environments. The villages on both sides of the water body are also intriguing - at 9 am, the only colour and light came from the hairdressing shop! The village buildings are literally under the bridge - one wonders what the villagers thought as the bridge took shape way above them. One of the benefits of travelling in winter is that there are no other tourists at these places. At the bridges there were just the locals going about their business. 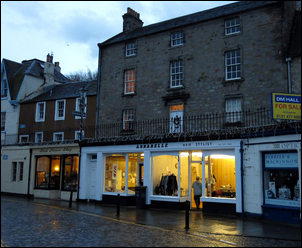 From there we drove to Edinburgh - an ugly city for the most part; drab and grey. We went to the castle but it was raining and Alexander and Georgina were both nauseous, so we didn't explore further. Tonight we are at Newcastle. 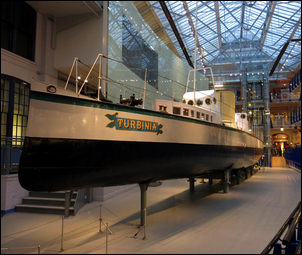 I got to the city museum at about 4pm (it was completely dark outside) and walked in the front doors to see - the Turbinia, the world’s first steam turbine vessel! It's in pride of place and looks every inch the 'greyhound of the seas' she was tagged. She is bigger than I'd pictured, narrow in beam but disproportionately long. Charles Parsons was obviously a very down-to-earth engineer; his models of different hull designs are powered very elegantly by rubber bands operating through reduction gearing. The rest of the museum looked very boring, but that's OK - I'd come to see just the Turbinia! On the way to Newcastle we stopped at the National (Scottish) Museum of Flight. Just a few trivial aircraft on display - like Concorde, a Comet, a Harrier and a Vulcan! 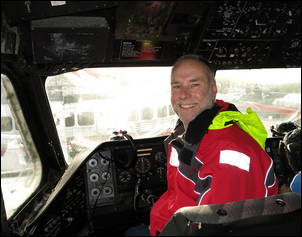 You're allowed to go on the Concorde - I didn't think it anywhere near as cramped as others have suggested. 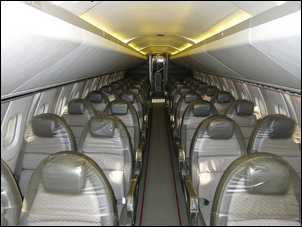 However, they also had the front part of a Boeing 707 there - and that was incredibly roomy... so I suppose it depends on the reference point. 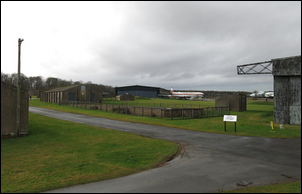 The museum is on an old WWII airfield and a lot of the buildings are intact. They are also well labelled and so it was fascinating just walking round, looking at the air-raid shelters, stores and Nissen huts. 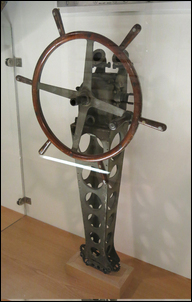 And a final highlight – they have the control column from an R34 airship – the first part of a ‘real’ airship I have ever seen.